and fading high-frequency propagation conditions. Conventional Baudot (International Telegraphic Alphabet No. 2) and ASCII (American Standard Code for Information Interchange) operators often must, under marginal propagation conditions, manually engage in time-consuming requests for repetion of portions of transmissions. Data is blindly repeated, or lost. With AMTOR, the equipment merely slows down during signal fades and resumes normal speed during periods of signal consistency. For this same reason, extended communications range is possible without error. 3. In the Amateur Radio Service, stations are required by Section 97.67(b) of the Commission's Rules to use the minimum amount of transmitter power necessary to carry out the desired communications. Use of AMTOR uniquely allows reduction of transmitter power to very low levels, because the effects of Power reductions on sending speed are immediately obvious to the transmitter operator. Thus, use of low power and reduced interference potential are normal by-products of AMTOR operation. It will also be easy for third parties to ascertain whether a particular frequency is occupied by stations using AMTOR, as both the sending and receiving stations are continuously transmitting 3/ (at a .45 second rate) with an audible "chirping" sound. Inadvertent interference resulting from a third station being unable to hear one station due to skip conditions is precluded. 4. As mentioned above, the AMTOR error-correcting technique maintains error-free copy over a very wide range of received signal strengths. When signals are low, the AMTOR station simply re-transmits the same data until it is received correctly. Thus, the relevant factor in AMTOR transmissions is the sending speed. Because the sending operator has constant and immediate knowledge of the rate of message transfer without being so informed by the receiving station, signal strength per se is irrelevant. 5. As defined by CCIR Recommendation No. 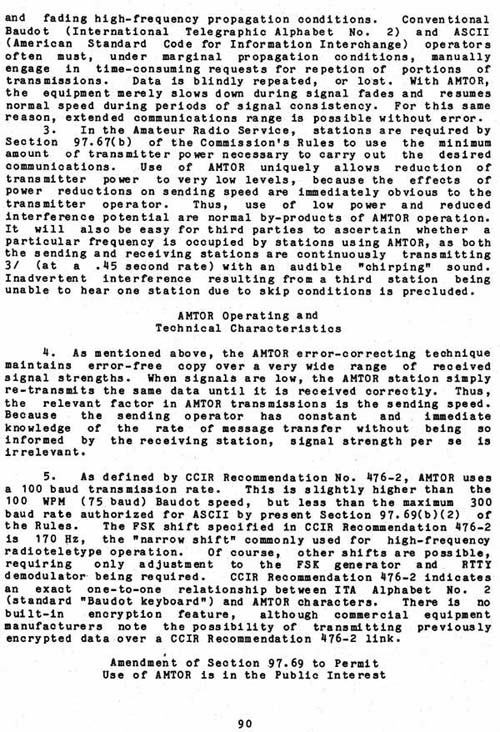 476-2, AMTOR uses a 100 baud transmission rate. This is slightly higher than the 100 WPM (75 baud) Baudot speed, but less than the maximum 300 baud rate authorized for ASCII by present Section 97.69(b)(2) of the Rules. The FSK shift specified in CCIR Recommendation 476-2 is 170 Hz, the "narrow shift" commonly used for high-frequency radioteletype operation. Of course, other shifts are possible, requiring only adjustment to the FSK generator and RTTY demodulator being required. CCIR Recommendation 476-2 indicates an exact one-to-one relationship between ITA Alphabet No. 2 (standard "Baudot keyboard") and AMTOR characters. There is no built-in encryption feature, although commercial equipment manufacturers note the possibility of transmitting previously encrypted data over a CCIR Recommendation 476-2 link.